I am referring the following circuit diagram. Can I simply change the value of C2 and L1 to transmit at a frequency below commercial FM band say as low as 40 Mhz? I know, I need to make a custom receiver to test it. But that's what I want. I want to send and receive audio singal within a small range say 10 metres, at a frequency around 40 MHz. Would it work? Do I need a different transistor? Any transistor has an upper frequency limit, but for most purposes, no lower limit. So the transistor should be fine for 40MHz in principle, in isolation. Although depending on how the circuit was designed, it may or may not actually rely on the transistor having a lower gain at a higher frequency. Saying that, I expect it would be fine for a crude result. Almost any small signal NPN transistor with similar characteristics should do. But as well as C2 and L1 consider changing R2 and C3. They are all high frequency components that need to be tuned together for best results. Although for experimenting, I would simply change C2 and C3 to double their current value, which is roughly inversely proportional to the change in frequency you want. To get a better idea of what's going on, construct the original circuit and use a 100MHz+ oscilloscope and a test audio tone to see how the circuit's meant to behave, then modify it to do the same at 40MHz. Not the answer you're looking for? Browse other questions tagged transmitter fm or ask your own question. How to switch a transistor when a radio signal is received? Questions about FM receivers and transmitters? 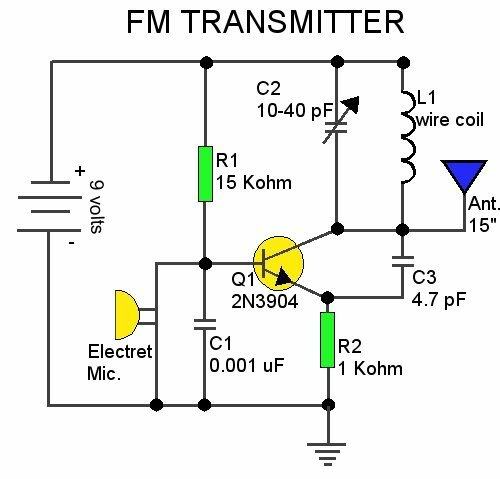 Can a filter circuit be built for the FM broadcast range to only pass the frequencies not bearing a broadcast stream?